BMW enthusiasts will know the older models came equipped with a tool kit in the trunk. The kits allowed the owner to perform tasks ranging from typical maintenance jobs to holding spare bulbs. Most modern BMW models have gone away from the kit now that BMW recommends the dealer do most of the maintenance work (as well as most owners not knowing how to do maintenance any work). Regardless if the tool kit is present in your car, BMW has still provided a tool with all models to properly tool to remove fuses. Without this removal tool, pulling fuses can be frustrating. The fuses are small and installed too close together to get a proper grip. Anyone with adult sized hands would be able to relate to this problem. The use of the tool allows for easy removal of any fuse design, old or new. 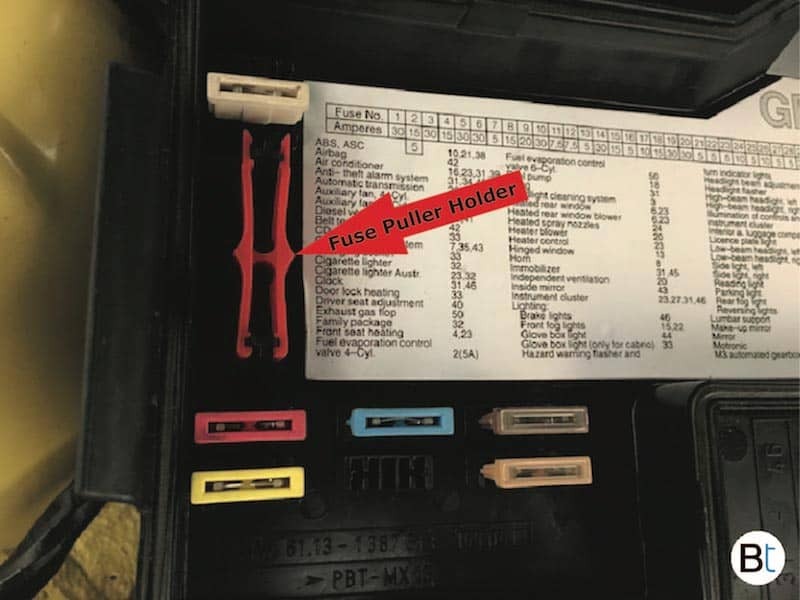 The fuse puller can also be used to reinstall a new fuse (making it a fuse inserter? ), however reinstallation by hand is simple to where the tool is not required. Where is the fuse puller located? 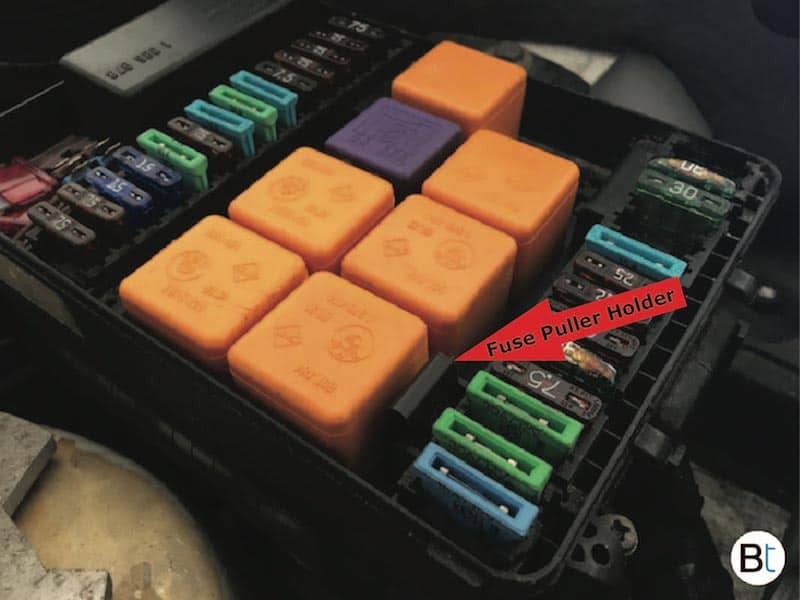 The fuse puller is located near the fuses, usually under the fuse box lid or near the fuses themselves in the designated holder. 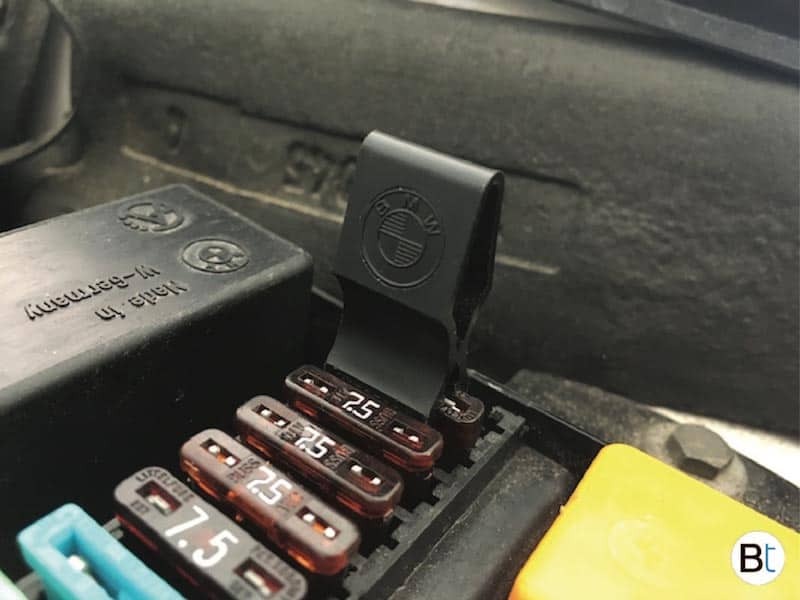 Older models had black pullers and are had to locate in a black fuse box, see the figure below for the location on the E30 model. 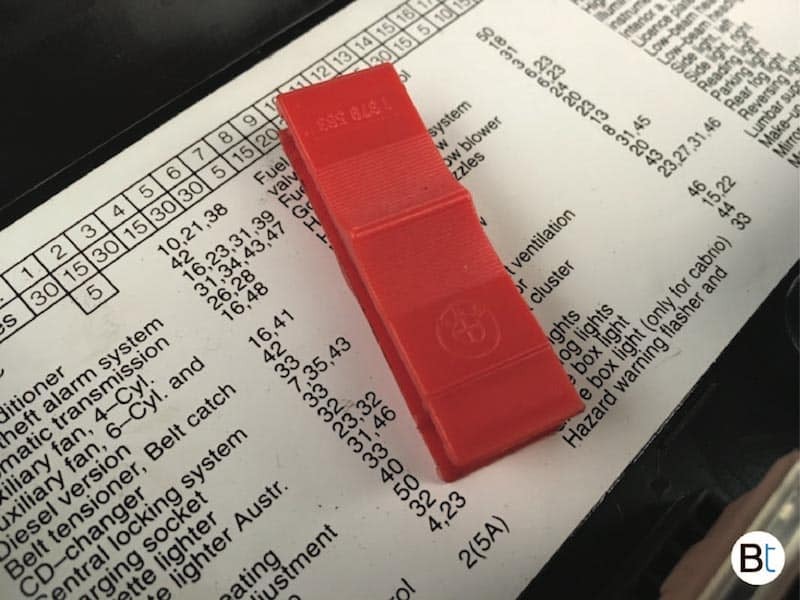 Later models have a red puller to make locating the fuse puller easier. How does the fuse puller work? The fuse puller works much like tweezers, just locate the puller to the top of the fuse with the open end, squeeze and pull the fuse out. Why are there different designs? The black style, as shown below, in the in the pictures is no longer manufactured and were found on older models. These can still be purchased used on eBay however. They are not rare since they were delivered with every older model from the 80s. 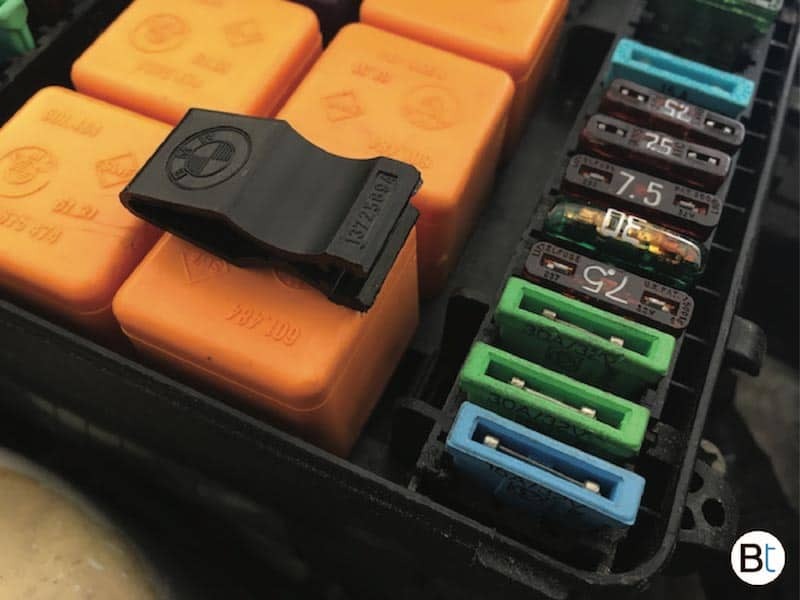 The newer design can still be purchased new from the dealer, but may not fit in the older style fuse holders. You can simply rest the puller inside the box as the lid will keep it from getting lost. 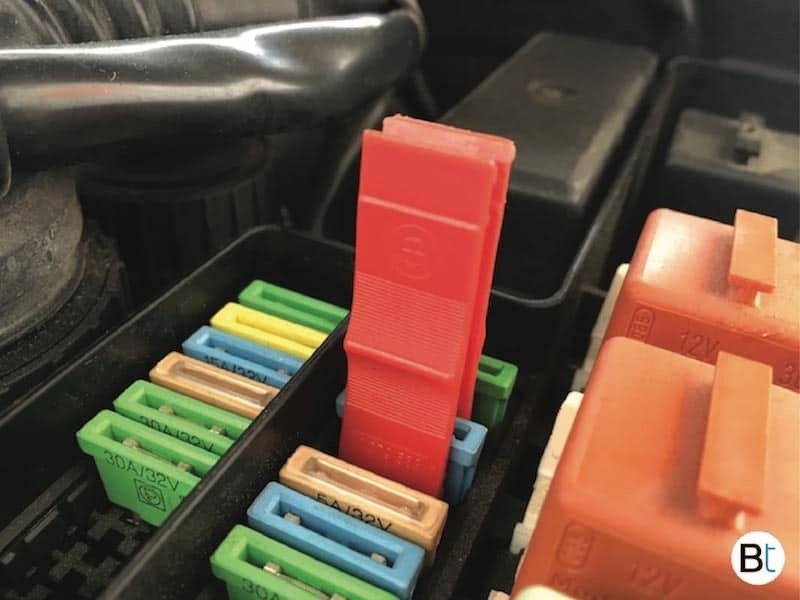 How much is a replacement fuse puller? Replacement fuse pullers can be purchased new for around $2 at most online stores. What is the OEM BMW part number? Any BMW dealership or any online parts store, just google the part number above.